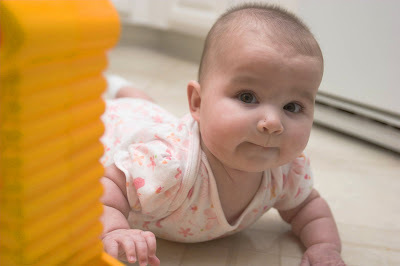 This is Eleanor trying to learn to crawl. I put her on the kitchen floor because I heard it was easier for babies to learn on a hard surface. (Not recommended for my germaphobic friends.) She can scoot herself a couple of inches now. I keep putting toys in front of her face or sitting in front of her saying, "Come here...come to mommy." Sounds mean, but she needs the motivation. Hmm...maybe I should get back to work. Grace learned to crawl trying to get the remote control.